When NASA officials set a new launch date for the space shuttle Endeavour, they will have to jockey around several other big events on the ground and in space: the launch of an unmanned rocket, the undocking of a Russian spacecraft from the International Space Station, and preparations for NASA's next and final space shuttle mission. Endeavour's first launch attempt on April 29 was called off due to a technical malfunction with one of the shuttle's power systems. The system, called an auxiliary power unit, is located in the hard-to-reach rear, or aft, section of the orbiter. Ground crews removed what is believed to be a faulty component, called the Load Control Assembly-2 (LCA-2) box, from the shuttle's aft compartment Monday night. Technicians will evaluate data from the inspections and will install a new LCA-2 box after evaluating the problem and making any necessary repairs. "The forensic testing began," NASA spokesman Allard Beutel told SPACE.com. "They're preparing to put a new box in, but they have to get some other issues prepared and ready first." That process, however, is far more complicated than simply picking a date once the repairs are complete. Launches from Kennedy Space Center must also take into account activities at the neighboring Cape Canaveral Air Force Station, where unmanned rockets lift off into space. An unmanned Atlas 5 rocket is slated to launch May 6 from Cape Canaveral Air Force Station, carrying a military surveillance satellite. While NASA is aiming to launch Endeavour after May 6, the Atlas 5 will have implications for the work currently going on at the launch pad. "If they launch in the afternoon on Friday, we're going to have to clear Launch Pad 39A for a few hours around the launch window for safety reasons," Beutel said. "If they slip, that will have an effect on us as well because we would have to do the same on Saturday." If the Atlas 5 launch is delayed past Sunday, the Air Force would have to stand down to make way for Endeavour's launch preparations, Beutel said, unless NASA decides it cannot launch the shuttle on May 10, and needs more time to evaluate the power system failure. Endeavour's launch delay also has consequences for the length of the mission. NASA has the option of extending the 14-day STS-134 mission by two additional days, if logistically possible. But, that option may be in jeopardy because it could conflict with the undocking operations of a Russian Soyuz spacecraft, which is scheduled to depart the space station May 23. "If we go on May 10, the full 14-day mission is unaffected, but the two extension days are affected because the undockings would be on the same day," Beutel said. "We're having to work very closely with the space station program on this, and there a whole bunch of factors involved. Ultimately it will be up to the space station program and what their priorities are." Ideally, the two extension days would be used to take advantage of having Endeavour's six shuttle crewmembers aboard the space station to get more work done to help ready the station for its future years. This is particularly important since NASA's space shuttle program will soon be coming to a close. But, with Endeavour's launch delayed, it may no longer be possible to extend the mission on orbit if it launches on May 10. For a launch on May 11, however, both extension days should be available. "Right now, there are no plans to change the Soyuz undocking sequence," NASA spokesman Kelly Humphries told SPACE.com. "We need to come up with a workable plan, but the things to consider include the crew work to be done in order to prepare and support the undocking. And then, after they're gone, you're dealing with three crewmembers rather than six crewmembers on the station." Endeavour's launch delay could also affect preparations for the very last mission of NASA's space shuttle program -- the STS-135 flight of the shuttle Atlantis. Atlantis is currently scheduled to launch June 28 to the International Space Station. The orbiter was slated to be moved from its processing facility to the tall Vehicle Assembly Building at Kennedy Space Center, where Atlantis will be joined with its orange external fuel tank and twin solid rocket boosters, on May 10. 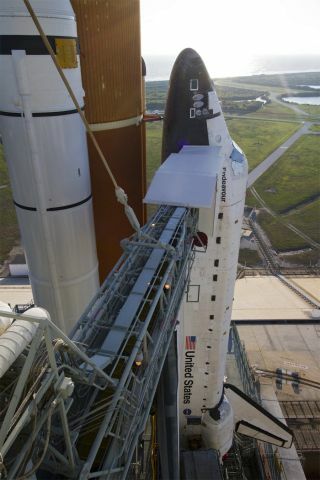 After that, Atlantis will eventually have to be rolled out to the launch pad. "We're all waiting to see how the repairs to Endeavour go," Beutel said. "Even if we get over to the Vehicle Assembly Building on the 10th, if for some reason Endeavour launches past the 13th or 14th, there's a potential to affect Atlantis' roll to the pad." While Atlantis is still on track to launch on June 28, if Endeavour's launch is pushed later in the month, it could potentially affect the timeline of the STS-135 mission. All in all, many of these big decisions will depend on the progress of the work being done now at the launch pad. Mission managers plan to reconvene Friday (May 6) to determine a more definite launch date for Endeavour's STS-134 mission, based on the results of testing that will be completed in the next few days.